It was sickening to awake to the devastating news yesterday that our beloved Notre Dame Cathedral in Paris – Our Lady of Paris – the jewel of the Kingdom of France, has been devastated by fire. Begun in 1160 and completed in 1260, over 850 years of art and history have been laid prey to flames - an immense cultural loss. Because of its position on the Île de la Cité, an island in the center of Paris and the oldest inhabited part of the city, the fire was conveniently observed from all angles. Thousands watched and observed on TV as the ancient wooden roof was engulfed in flames and the spire over the crossing toppled into the inferno. The cathedral, which locals fondly describe as resembling a ship moored on the either bank of the Seine River with flying buttresses resembling oars, appeared as a sinking ship on fire. Fortunately, the church still stands, proving medieval construction techniques won the day. I have spent the day going over old photos, recalling many fond memories of visiting Notre Dame with family and student and tour groups. Last year I had the pleasure of visiting twice and this June I would have been there again leading a tour of Canadians and Americans, delighted to introduce them to art of the noblest order, this “book in stone.” Each year some 12 million visitors have entered through the door of Notre Dame to admire its grandeur. It is a supremely beautiful sight in what is widely regarded as one of the world’s most supremely beautiful cities. While Notre Dame is neither the oldest, nor the largest, tallest or even the most typical of Gothic cathedrals, its pre-eminence is renowned the world over. There are also many cathedrals in France with the name Notre-Dame (“Our Lady”) -- Notre-Dame of Chartres comes to mind, as well as Notre-Dame of Rouen, Amiens, Strasbourg, among many others -- but, Notre Dame de Paris is the "Notre Dame." It was at this Notre Dame that Joan of Arc was beatified, Napoleon crowned emperor, and Mary Queen of Scots married. Within these sacred walls the French prayed for victory in the Crusades, for an end to the 100 Years’ War, and for deliverance from the horror of the Black Death. 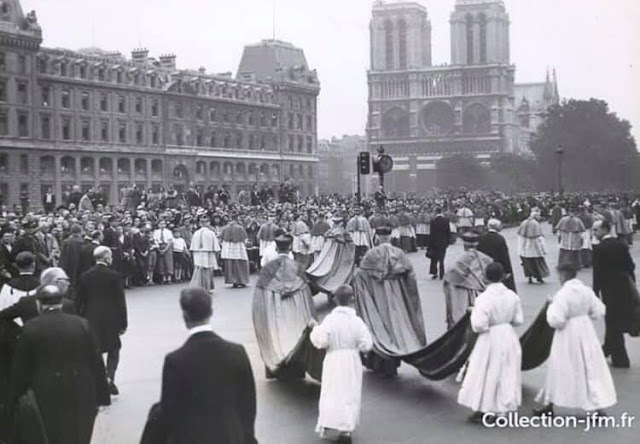 Charles de Gaulle came to Notre Dame in a victory parade in 1944 to celebrate the liberation of Paris from the dreaded Nazi occupation; twenty-six years later his funeral was in the same cathedral. Notre Dame remains the cathedral of cathedrals, the epitome of the gothic style, the symbol of Paris and of France. Eight centuries of French history, brilliant and sombre, tumultuous and contemplative, live in her stones and have walked on her great pavement. The great men and women of France have stepped through her portals and many of them are buried beneath her. Since Pope Alexander III laid the cornerstone in 1163, its dramatic position on the stage of French history is indisputable. I have always said that the cathedrals of France have suffered horribly at the hands of various political upheavals through the ages. Despite the horrific trauma of the French Revolution, Notre Dame survived, although it was a target and suffered severe vandalism. In the center of the parvis (from the Latin word for “paradise”), the square in front of the cathedral, is a slab. From here all distances are measured to the remotest frontiers of France, symbolic of the cathedral as center of France and the country’s life. Around the neighborhood of the cathedral, students of art and architecture can be seen sketching and painting the cathedral, with careful lines penned in charcoal, watercolour or acrylic paints. The dazzlingly bright afternoon reflection captured on paper. The essential harmony and complexity of Notre Dame can never be taken for granted. Its graciousness cannot and has never been reproduced. The vertical and horizontal elements appear in perfect balance. All of this is irreplaceable. Few perhaps realize the sheer measure of knowledge, study, care, taste, resolution and experience that go into the construction of such a building. Every builder who observes the construction is impressed by the numberless precautions that are resorted to in the construction, with a perfect combination of the prudence of the practical builder and the daring of the artist full of invention and power and imagination. Visitors admire the immense upward thrust of the buttresses that divide the façade into three parts; the pointed arches of the portals, the looping arcades, the sculpted figures, the four soaring bays of the towers. Further, the horizontal bands of the Gallery of Kings (the 28 figures are replicas as the originals were destroyed during the French Revolution), the tier of the rose window that dates from 1270, the front towers themselves. After the fire, visitors will only be able to stand in the grand plaza in front of the western façade and weep, the open area that was laid out by Baron Haussmann in the 1800s. Indeed, in this life, something is always lost while something is always gained. Let us look to the future with hope and confidence. The people will have to come together with the fever of building as they did in the Middle-Ages. With great effort did our medieval French forefathers dedicate to Our Lady in the age of faith these priceless Gothic cathedrals that we still have today, despite their age, built in the eleventh to the fourteenth centuries. Millions of tons of stone were quarried by the medievals to construct some eighty gothic cathedrals in France, some five-hundred large churches and countless smaller ones. Notre Dame is the jewel of French heritage and history, the starting point of all the roads of France. In some ways the destruction of the symbolic edifice is a metaphor for the fall of Catholicism in France. Let us pray to St. Genevieve, the patron saint of Paris, that she may intercede for Notre Dame and for the firefighters and rescue workers as well as for the Catholic identity of France, the “eldest daughter of the Church.” St. Genevieve in 451 AD called for a “prayer marathon” to save Paris from Attila the Hun. Her prayers worked and the city was saved. Domine, salvam fac Galliam!